Was anyone injured the first day? Not according to BC's official report nor the media in attendance. Someone will go down before the first game. Keep your finger's crossed it is not anyone critical to the team's success in 2017. Shea is a construction site now, so the team has to practice on the Alumni Field. That's not ideal due to the size constraints and the heat. But it really shouldn't matter all that much. The team practices in the stadium when the bubble is up. During the summer, Addazio held camps on Newton. The logistics of transporting the whole team there for August would be a logistical nightmare. Was there anything of note that BC didn't mention? According to Thamel, AJ Dillon is 247 lbs. He looked big in his recruiting videos (but that was in comparison to New England prep schoolers). At 247, he is going to look big among ACC players. At that size, he might not need a great. He can just run over people. Did you watch the Spring Game? Well these guys on Youtube have done us all a favor of cutting it down to 34 minutes with just action. Seeing it again is a reminder that our QB situation will probably be better than expected. Wade looked decisive in his snaps and made some good passes. Brown was less poised in the pocket but did show a good arm and good escapability. This was all against a talented ACC D (BC's own). But as of Monday, the Spring Game starts to matter less and less. It will be up to one of the QBs to stand out and earn the starting spot. I don't know what to make of Jim Christian's offer to Chris Herren Jr. Barring a huge turnaround, Christian is not going to be coaching any of these new offers. If tradition holds, most recruits will bail or be unwanted by the new coach. When you throw in the Herren family history, that's a whole lot of baggage for a young kid starting the process. As of now, Herren is a mid-level recruit. The recruiting services don't expect him to be a difference maker. BC is the first Power 5 program to offer. The BC interest may spark other programs to offer or they might just consider him a legacy recruit from a lame duck staff. I know Christian has to keep recruiting. I just wish he would pursue elite talent or kids who can be pushed off by the new staff without any hard feelings. If Herren does eventually commit, I hope he makes the best of his BC career. His uncle and father both washed out at BC while battling personal demons. The pressure from fans and the media would be to finally fulfill the Herren potential (I have no idea if there would be family pressure). I also hope the new BC coach honors any offer. It would be nice to have a Herren-BC story with a happy ending. Ole Miss used their new open staff spot to hire former BC player and coach Jack Bicknell Jr. This is probably only a one-year stop for Bicknell. Best of luck to him and hopefully he can leverage the opportunity into a more stable role. The Seahawks traded KPL to Kansas City. In Last Chance U, Season 2 East Mississippi head coach Buddy Stephens goes to visit his father who has terminal cancer. 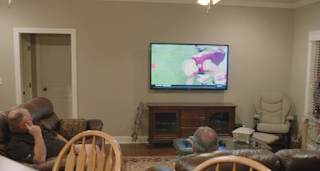 While visiting, they watch BC football (I assume it is the bowl game). That is the only BC reference in two seasons of the Netflix show. For a variety of reasons, BC stays far away from the JUCO world. But don't let that distance keep you from watching. The show remains an excellent look at how the sausage is made in College Football. It is well worth your time. Due to the popularity of Season 1, Season 2 takes on a whole different vibe than the first year. All the participants are hyper-aware of the cameras and how they might be portrayed. I also think the team and school benefited from the show's notoriety as there is an influx of Power 5 transfers looking to get back to the big time. East Mississippi made their name with Power 5 problem children, but this year's team had an unusually large amount of second chancers. I assume that when these guys went looking for JUCO options a year ago, being on TV was a major plus for East Mississippi. But even if Scooba, Mississippi is a different world from Chestnut Hill, that doesn't mean there isn't a lot to learn. Our players deal with the same frustrations with coaches and classes. The bonding formed out of playing together and isolation from the rest of the world is similar. Plus the job aspect is the same. We want these guys to be playing for the love of the game, but most are using football to get somewhere else. I continue to struggle with the hypocrisy and exploitation of college football, yet I still love it. Because of the nearly unlimited access, Last Chance U puts all of those issues on full display. And in the end, I still enjoyed the eight hours, was rooting for most involved, and couldn't wait for real football to start. On Monday the Football team officially starts practice. Like all summer camps, there will be plenty of installations, scrimmages and position battles. But the team will also do some work getting ready for Week 1: Northern Illinois. In case you forgot, the whole set up against Northern Illinois is a little off and not in BC's favor. We're on the road and the game is a Friday night with a 9:30 PM kickoff. Because it is the first game, the team won't be breaking set routine, but those little schedule issues add up. It makes adjusting that much harder. Remember we had unexpectedly tough MAC road games to start the 2006 and 2004 season. BC is only a slight favorite now. While the enter the season with more experience at QB than BC, none of it is all that good. Ryan Graham has more experience and ok-ish stats. Daniel Santacaterina has youth and upside. Neither has faced the sort of pressure BC can bring. BC needs to attack these guys early. We have an advantage on the OLine and need to ease our QBs into the game and season. The plan should be to run the ball and run some more. Sounds just like Addazio, right? I just hope that there is a bit of creativity in the approach as BC doesn't want to challenge NIU's respectable secondary. In a season low on cupcakes, BC needs a win to start the year. NIU is a very winnable game. Let's hope the guys start thinking and preparing for that Monday. ESPN hosted another group of ACC coaches Tuesday and Addazio made the rounds. He went on SportsCenter, the podcasts and met with ESPN's CFB writers. It was all fine and good exposure, but there was nothing revelatory about any of it. I know this is part of reaching beyond the BC diehards, but it would be nice to hear something beyond the dude and defense. Maybe he could discuss how he is tweaking his offense or how he has changed the roster in five years. The podcast did allow Addazio to credit Pasqualoni for Landry's development. I do appreciate the role Coach P plays. I wish Addazio could find an offensive version of Coach P.
Hot Seat talk is a consistent point of discussion in college football. With the coach being such a focal point, getting rid of a loser and hiring a star, or up-and-comer can energize an entire fanbase. It is nearly August so the Hot Seat lists are rolling out and Addazio is a frequent name, but I don't think the national college football writers have a good feel for this. I think Addazio is safer than any of us realize. Martin Jarmond was tasked with energizing the BC Athletic Department. Unlike Bates, he wasn't hired just to fire a football coach. If anything, hiring a guy with clear ties to Urban Meyer was a signal that this was a friendly hire for Addazio. Where Bates couldn't deliver on Addazio's needs nor control Addazio's personality, Jarmond is supposed to raise money, sell tickets, help recruiting and level with coach. Addazio didn't pick Jarmond, but he wasn't sidelined during the process. Due to their connection, I think Jarmond will give Addazio another year if he only wins six or seven games. Even four months before it might happen, most BC fans could already pick out the rationalizations: "he has a winning record nearly every year" "BC went to a bowl again" "there is a great recruiting class coming in" "With Clemson and FSU so strong right now, Addazio is doing his best" "give him one more year with _____ (QB)". If Addazio loses, I don't think Jarmond will use up good will keeping him on for another year. But if he just gets by -- again -- he is safe. Raycom puts together a series of summer preview shows that you might catch on your local stations. BC is rarely featured, but the producers clearly like Addazio. They already released this clip of him firing up the team last year. If BC just won a little more, Addazio would be a star. TV eats this fired up, run through a wall type locker-room stuff up. But you need to back it up with wins. With business models constantly influx, it is hard to predict where sports coverage is going. BC is sort of in a weird position. We are not a national brand that gets covered regardless (i.e. Notre Dame, Michigan). We don't have an intense fanbase that drives hyper-local coverage (think Nebraska or most of the SEC). Instead we are a mid-level program lost in a major sports market. Coverage from the Globe and Herald shrinks every year and we rarely get attention from the local sports radio or cable stations. Maybe things will change with the Boston Sports Journal. Former Globe and SI writer Greg Bedard is starting a subscription service with a focus on the pro teams. I know BC has already reached out to ask for BC to be included. There is a niche. Eagle Action has a subscription model but can't be overly critical because they need recruiting access. The blogs show there is demand for information, but the free model doesn't drive enough revenue to support a full-time, on-site reporter. Maybe the Boston Sports Journal can fill the gap. Good luck to all those involved. BC could use the support. 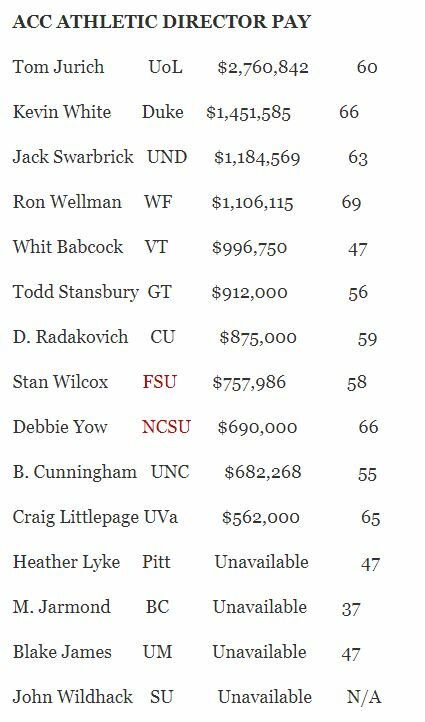 Friday saw the updated release of Athletic Director pay among ACC schools. The list is incomplete since private schools do not have to disclose their Director's salaries. But the list does include Duke and Wake Forest. Given BC's revenues and history, we can assume that Jarmond is in the lower half. Based on some uncovered tax filings in the past we know that GDF and Bates made approximately between $500,000 and $600,000 annually. As much as I think BC needs to have competitive salaries, there is an aspect of bidding against yourself when it comes to these high level positions. If BC had been paying more could we have hired a "better" AD than Jarmond? Maybe an older one, but not necessarily someone who would guarantee a turnaround. I am sure Jarmond's salary will come out in the next year or so. At this point it doesn't really matter. What matters is he needs to get fans excited, raise some money and figure out what to do with football and basketball. Forget for a moment the low expectations for the season and the program. That is a very appealing home schedule. You get Duke, Notre Dame, and Syracuse at Conte. Plus a few winnable games with some of the lower level ACC teams. Jarmond and his new crew need to do something to get people to these games. It probably won't make a difference for Christian, but building some momentum about basketball and figuring out what ticket sales strategies work will help the program down the road. BC teased out the pictures from photo day. It doesn't look like there have been any noticeable changes to the uniform. Greg Toal is back coaching and there of course is a BC connection. He will be a DLine coach at Bergen Catholic under Nunzio Campanile. This won't help BC's recruiting at Bosco, but it won't hurt recruiting at Bergen Catholic. This article assumes that Wade will be the starting QB this fall. -- Darius Wade, JR. It is interesting to note that the updated BC roster lists Wade as a graduate. That means he could have walked this offseason and didn't. Regardless, he has two years of eligibility remaining. Maybe this is the year that he makes the leap. Maybe the extra competition will spark something. If he doesn't take over the starting spot, I would be surprised if he sticks around for his final year of eligibility. -- Anthony Brown, R-FR. Brown is every fan and coach's favorite type of QB -- the future star who has yet to take the field. Brown's got all the tools. He certainly has all of our expectations. But can he deliver this fall? Addazio is not in position to take too many lumps, so Brown can't play like a redshirt freshman. He needs to be very good from the very first time he takes the field. -- John Fadule, SO. Fadule is listed as a sophomore but technically has three more years to play. Although it was only two years ago, it seems like a different time when he was actually BC's starter. That was the last time Addazio threw everything against the wall to see what stuck. I don't expect Fadule to ever get serious playing time again, but he is not a bad guy to have as a back-up. -- EJ Perry, FR. The local kid. If things go well, Perry doesn't see the field this year. He redshirts and grows with the program. If he plays, it means he's been awesome or things got really, really bad. -- Tate Haynes, FR. Given Addazio's track record of moving speed guys off the QB depth chart and into other positions, I would be surprised if Haynes ever plays QB for BC. The crowded depth chart is one obstacle and BC's consistent need for any type of playmaker elsewhere is another. Like some of the other long shots, Haynes only sees the field if he is amazing early. I wouldn't mind it playing out like that. -- Dennis Grosel, FR. A recruited walk-on is probably the toughest sell at BC. If we recruit him, he obviously has enough talent to play somewhere. Some other program would probably offer some sort of scholarship. Yet these guys come to BC out of their own pocket. Maybe the pitch of potentially playing Power 5 instead of FCS is enough for some kids. Grosel arrived in the winter and got to play spring ball. We saw nothing that made anyone think he will play soon, but not a bad kid to develop in the program. -- Matt McDonald, FR. It is still unclear if McDonald is still a walk-on or has been given a scholarship. He signed as a greyshirt but is part of the team now. Another late bloomer who has nothing but upside. Even though we were burned two years ago with a young, untested QB depth chart, I am a bit more optimistic this time around. If neither Wade or Brown look good, I have a hunch that one of the long shots will develop. With seven on the roster, the odds say someone should. If not, then we have a coaching problem, not a QB problem. The ACC media predicted BC to finish last in the Atlantic Division. No big deal. The ACC Media has consistently underestimated BC. Part of it is due to the Carolina-centric group that gathers at this event. BC is out of sight and out of mind for most of them. Part of it is the perception that BC's early ACC success was an exception and ignores our long history of above average college football success. Those issues I've come to accept. Plus, it is not like BC is coming off a huge season. But what surprises me in the poll is the big gap between BC and the other Atlantic middle class. What am I missing about these other teams? NC State?!? Are they better than BC? Maybe, but not that much better. BC beat them on the road. Doeren has a worse ACC record than Addazio and has done nothing to signify that they are on an upswing. Wake?!? Like NC State, BC beat Wake on the road last year. I like Clawson, but his recruiting has been poor and his ACC record terrible. Why are they suddenly such a sure thing? Syracuse?!? I think Syracuse is a bit like BC in that the perception and geography of ACC Media will always hurt their polling. They at least have a gimmick in their offense that will help them steal a game or two. Are they better than BC? I don't think so. But I also don't think they are that much worse than the other ACC also-rans. BC will have an elite defense this year. If the offense improves, they should be as good as last year if not better. While I shouldn't be getting worked up about a team that finished 6th in the Division getting snubbed, I just don't understand the spread of teams. All of these squads are severely flawed with seemingly mediocre coaches. In my opinion the difference between 4 and 7 should be about four points, not four hundred. No one likes the ACC Divisions, but that is all people agree on. When it comes to fiixing the divisions, no one agrees. This article gets into a solution and other issues of disagreement among the conference members. My simple solution remains, a division made up of old Big East teams + Virginia and nine ACC regular season games. Some of this you might have seen. Some of it will be new. Either way, Addazio and his players did their job. They represented the school well and got out that message that BC will compete this year. I wanted confidence. I got it. Addazio seemed happy and excited about the season ahead. The correlation between his confidence and BC winning might not be great, but it gives me some hope going into the season. None of these coaches say much, but Addazio did say a few things that we can over analyze. Here are a few of my takeaways. 1. The QB job is Anthony Brown's for the taking. In his press conference Addazio mentioned Anthony Brown first. That's telling. He acknowledged that Wade would be the starter today and had more first team reps in the Spring, but he still mentioned Brown first and made it clear the job is up for grabs. Since most of the media prepared their questions with Wade in mind, Addazio did address Wade and said he thinks the veteran is finally coming into his own. Wade will get a chance. But Addazio's gut is clearly with Brown. 2. Addazio has heard the criticism of the offense. He makes reference to scoring excitement and that comes off a little condescending as if fans know nothing. But he misses the point. BC's offense hasn't just been low scoring and boring, it has been highly inefficient and detrimental to the world class defense. It sounds like we will keep the bowl-game tempo and also have the pro+spread concepts. My fear is that it sounds like a grab bag approach again. Why do three things well, when you can do a dozen things poorly! My hope is the oline and run game are mature enough just to run over people. If this season comes down to offensive schemes and execution, we're done. 3. The D should be great again. Despite the personnel loses, Addazio rattled off the whole returning roster and is pleased with the talent. With just those returning stars playing at their same level as last year, we have a Top 30 D. If those guys improve and the new guys make an impact, BC should have a Top 10 D again. As more reports and content come out in the coming days, I will post it. But for now, it looks like Addazio is feeling good. I hope he has reason to feel that way. The ACC Media Days start Thursday. BC won't be the focus, but Addazio will run through the conference's media gauntlet. Based on what he says, we will know how confident he is in the team's chances for this year. Early on in his tenure, Addazio said this was a five year rebuild. Now here we are in Year 5. In theory this should be when everything comes together. Yet at times last fall and even in the spring, Addazio hedged a bit with his expectations. If he is hedging this week, I am taking it as a sign that things are bad. This guy has been pointing to this season since he started. If he doesn't think he can deliver, then this will be a lame duck, lost year. I understand that there is very little real content at these sorts of events. Coaches and players answer with standard rehearsed, empty quotes. But we will still be able to read into Addazio's key points. I want to see and read that he believes we can compete with anyone on our schedule. If he keeps talking about youth and building the program down the road, it is going to be a frustrating season. As expected Bill Connelly's extensive preview on BC was not positive. He expects a 4-8 season, explaining that the tougher schedule will make the great D/terrible O less successful this year. Connelly is not unique in predicting BC's struggle, but he does inform his preview with some fresh angles and issues. For example, how many BC previews would put such a focus on attendance? Wins only matter so much if you’re hurting your fans’ eyeballs. Because BC still had an efficient defense, Eagles games featured a non-stop barrage of three-and-outs. At least, as long as they weren’t playing somebody good. In four games against S&P+ top-20 teams, BC got outscored, 202-24. He's right. Fans have not really returned after Spaz. I think that is where Daz's utter failure in Year 3 will prove so important. There is an underlying skepticism to his coaching that won't go away with 7-6 seasons. S&P+ gives the Eagles a greater than 32 percent chance in only five games this year. To reach another bowl, they’ll have to win every semi-winnable game and at least one big upset. This is where I generally have more belief than most national guys. The schedule is tougher than last year, but it is still not that tough. BC’s offense has been so awful that it’s almost jarring to remember the Eagles had a Heisman finalist not even four years ago. In 2013, Andre Williams powered an attack that ranked 30th in Off. S&P+; in 2014, without Williams, the combination of quarterback Tyler Murphy and freshman grinder Jon Hilliman kept the Eagles at 50th. In 2015, BC fell straight to the bottom. Three different freshman quarterbacks struggled, Hilliman got hurt, nobody caught more than 17 passes, and the Eagles crashed. Sensing a problem, Addazio brought in Loeffler, which makes you wonder if he understood the problem. I think we will look back on the Day/Brown coordinator combo and realize that they both made Addazio look batter than he was. The failure of the O since Day left is mostly on Addazio for not having the right approach, the right coaches or leveraging the talent he had on the field. There is a lot of chatter that former BC assistant AD and current Kennesaw State AD Vaughn Williams is coming back to BC as Deputy Athletic Director. When BC fans -- including me -- were speculating on AD candidates, Williams was mentioned. His past ties to BC and his experience running his own program made him a logical candidate. This Kennesaw State twitter account is going all in that it is a done deal. They don't seem all that broken up about it which normally sets off alarm bells that we are getting a lemon. I am not as worried about Williams not being a great AD. This will be Jarmond's show. Having a BC grad with BC experience working under him is not a problem. Williams' most notable BC-related decision was hiring Al Skinner to be head basketball coach at Kennesaw State. His roles at BC varied. I would be encouraged by this hire. Now let's see if it happens. SB Nation's Bill Connelly tweeted the below out this weekend. It seems like this is a preview his BC breakdown. The chart doesn't show anything BC fans don't know -- the offense stinks -- but it will be interesting to see who and where Connelly points the blame. It rightfully belongs to both Addazio and Loeffler. The two have a ton to prove this year. Another week, another batch of links on Harold Landry. He better be ready because he will clearly be the focus of every offense we face this season. -- Being called the top senior defensive product in the 2018 Draft. With the Hawkins situation still looking bleak, it is good to know another one of Jim Christian's late additions is enjoying BC. Steffon Mitchell gave this Q&A about his outlook at BC and his development as a player. I still don't know if he is a difference maker, but maybe he will help the team culture a bit. It looks like we need it. One of the bright spots of summer was Jim Christian's staff landing 5th year transfer Deontae Hawkins. There has been speculation and gossip for weeks now that he's not coming. I wasn't sure if it was an academic issue or something else. Well, now his old coach put the gossip out there saying "I don't think he's going to Boston College." Others still think BC is in the picture. Regardless, this late stage doubt is not a good long-term or short-term sign. Christian needs help ASAP, and this would be a set back. And if Christian doesn't win this year, he is probably gone. How long will BC's recruiting class stay in the Top 25? BC's 2018 recruiting class currently ranks as the 21st best on Rivals. This is easily the best start for Addazio's recruiting and looks like it might end up as the highest rated. Perception and momentum are important in college sports, so the good showing helps more than just the program's recruiting. By Signing Day, I wonder if BC's ranking will as be as high. BC moved so high by getting so many verbals this early in the process and making sure the rating on those players is decent. Addazio only has a few spots open so barring some elite prospect committing to BC, the points earned for the ranking is probably not moving much. This is one of the reasons why I don't think BC will maintain its rating. The other is the programs not currently in the Top 25. As of July 5, Michigan, Washington, Alabama, South Carolina, Mississippi State, Ole Miss, Auburn and Florida are all behind BC. Most are still pretty early in their verbal list. At least four of these programs will end up higher than BC based on reputation alone. These services are built to serve the large fanbases. They are not going to leave a SEC school other than Vanderbilt outside the Top 25. In the end, I want Addazio to finish the class well. But it might not really matter now. He has already changed the narrative and perception. Even if things whimper out, most of the fans and media are going to call this Addazio's best class yet. Fireworks over Boston College. #HappyJuly4th! Monday morning saw a few erroneous reports that former BC Basell player Pete Frates had died. Just as quickly as the fake news spread, Pete's family and friends got word out that Pete was still fighting and still alive. At a time when Pete is in the hospital and fighting for his life, I don't know how the family handles these sorts of distractions with such class. Pete clearly has the right perspective as he posted this tweet later in the morning. Astroturf is pretty proud of the work they did at BC. Here are some of their pics taken during the install. In honor of Canada Day, what's up with this supposed Canadian commit? I tweeted about BC Canadians Saturday and someone emailed me a question about this Canadian, Ezechiel Tieide, an athlete from Montreal. According to this service he is a BC commit!?! I think the service is jumping the gun that Tieide is a commit because the kid's Twitter account has no mention of it and none of the U.S. recruiting sites have him down. I have no problem with the offer since we have had pretty good success finding underrated, under developed Canadians. Maybe Tieide is the next one. Or maybe he is just trying to use a supposed BC offer to drum up interest. Although coaches can't talk about recruits, when a guy like this claims an offer, the truth usually gets leaked out.